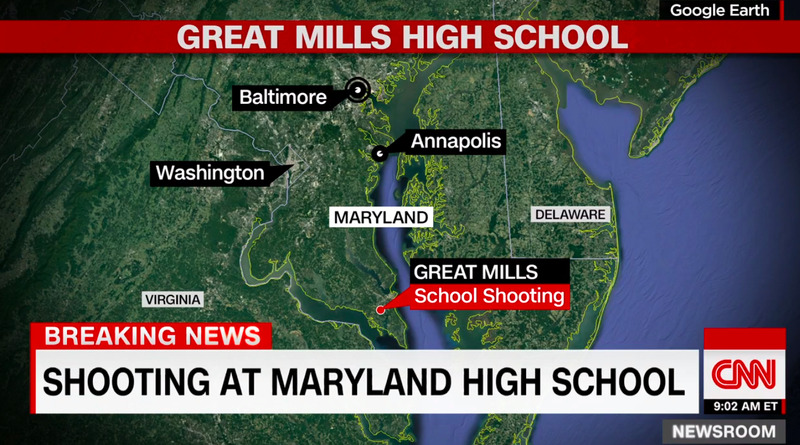 Police responded to reports of a shooting at Great Mills High School in Maryland just as classes were getting underway early Tuesday. The shooter is dead and two students are in critical condition, law-enforcement officials said. An armed resource officer on duty at the school engaged the shooter. Great Mills is in St. Mary’s County, Maryland, about 65 miles southeast of Washington, DC. Two students were injured at Great Mills High School in Maryland on Tuesday morning in a shooting that was interrupted by an armed resource officer there, law-enforcement officials said. The gunman, a student, is dead, St. Mary’s County Sheriff Tim Cameron said. Reports say the shooter, who has not been identified, fired at a female student in a hallway just as classes were getting underway, as well as at another student. The resource officer on duty then engaged the shooter. The officer was not injured. The shooter and the two students were transported to local hospitals. A 16-year-old female student is in critical condition, while a 14-year-old male student is in critical but stable condition, Cameron said. Authorities first responded to reports of gunfire at the school around 8 a.m. The St. Mary’s County Sheriff’s Office, along with state police and special agents from the Bureau of Alcohol, Tobacco, Firearms, and Explosives, also arrived to investigate. The St. Mary’s County Public Schools website said students were being bused from Great Mills to a nearby high school where their parents could pick them up. A Twitter user named Mollie Davis said she was inside the school during the shooting. I just boarded the bus to leave the school to go to the pick up center. I feel like there’s so much I want to say but I can’t find the right words. I wish everything was different. Rep. Steny Hoyer, whose congressional district includes Great Mills, also said his “prayers are with the students, parents, and teachers” and urged everyone to obey instructions from local police. Last month, 17 people were killed in a shooting at Marjory Stoneman Douglas High School in Parkland, Florida, sparking a debate about the regulation of guns in the US. Many students participated in a nationwide school walkout last week to protest gun violence, and thousands are expected to attend the March for Our Lives in Washington, DC, on Saturday to call for stricter gun regulations.